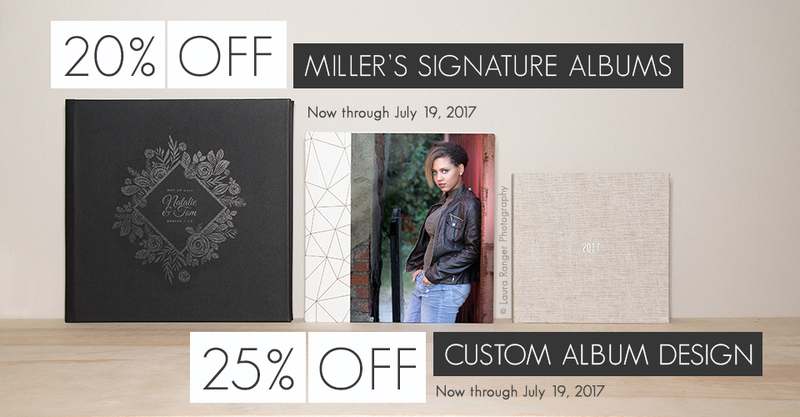 Now through July 19th, enjoy 20% off Miller’s Signature Albums in ROES and Designer Plus (no code required). Create an album that represents everything you hold dear. Built with handcrafted precision and timeless style, you can deliver a stunning keepsake to your client in as little as 2-3 days. Not enough time to design your album? Commission our expert team of designers and save 25% on a Custom Album Design tailored specifically to your style. Check out all the possibilities with Miller’s Art Department and get started. Please note: This sale is valid for Miller’s Signature Albums only. Add-ons (Foil Stamping, Debossing) and Miller’s Signature Books will not be discounted. Sample Albums do not receive an additional discount (samples are discounted by 25%). This offer is available through ROES and Designer Plus, no code necessary. The sale price will not be reflected in order summaries or confirmations. The discount will appear once the order has been received by the lab. This offeris not valid on orders placed prior to the sale. Please note, the cost of the Custom Album Design does not include the cost of the physical album. The sale price expires July 19th, 2017 at 11:59 p.m. (Central). What kind of cover does the black album on the left have? It appears as if it is the Custom Illustrated Cover with silver printing? Are you offering printing other than black? Hi Leslie, you are correct that it is Custom Illustrated. We still only offer this service in Black, it’s a little tough to show visually. Hello Millers! I am trying to make use of this sale but I am not seeing the discount reflected and at the payment screen. Can you please confirm how this is handled? Thank you! When I make an album in my Roes application, it does not automatically give me the 20% off. How do I apply the discount? Thanks! Hi Catherine, this promotion does not apply to sample albums. Thanks for reaching out! Hi Alli, the discount is applied once your order has been processed by the lab. Hi Ariana, the discount is applied once your order has been processed by the lab.